Network, discuss, and learn with APhA members on APhA ENGAGE community! Who is the American Pharmacists Association? The APhA Board of Trustees is responsible for broad direction setting of the Association. Policy for APhA and the profession of pharmacy as a whole is developed by the APhA House of Delegates that meets each year at the APhA Annual Meeting & Exposition. Day-to-day activities of the 130 dedicated APhA professional staff are led by Executive Vice President & CEO Thomas E. Menighan, BPharm, MBA, ScD (Hon) and the senior management team. Read more about APhA's leadership. APhA members, leaders, and staff travel throughout the country to promote the profession and be the voice for pharmacy. Read samples of this important work. 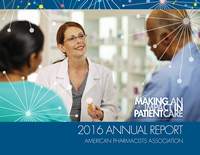 Our APhA 2016 Annual Report shares our year in review with you! Working at APhA will allow you to meet your career goals and satisfy your desire for professional challenge. Learn more about working at APhA. Did you know that the APhA headquarters building has become a coveted special events venue? The view is amazing; come and see!